By now it should be clear that only by our rule can everyone experience the full blessings of government; and though we mean to rule with benevolence, make no mistake, we mean to rule. Election Year 2016 is going to be symbolic of more things than one might think at first glance. 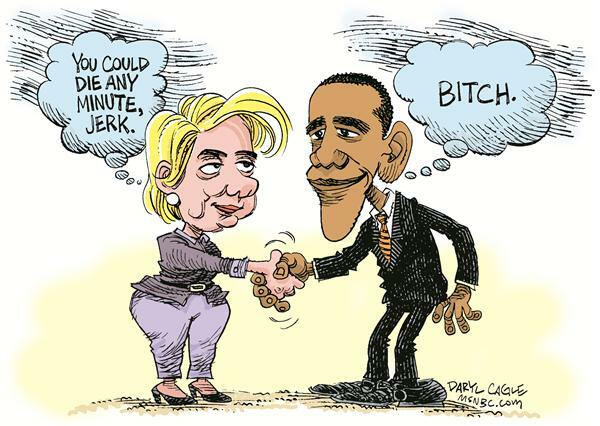 As expected, the Democrat nominee will be the humorless, uncharismatic Hillary Clinton. Rest assured that the GOP will foist another unpopular establishment candidate on a base that despises him, because the field is too full and Republicans remain too fractured behind single issues and purity tests to get behind one compromise conservative. That person is Jeb Bush who remains remarkably unperturbed by the Bush Fatigue that is still evident among their ranks. What you should not expect in 2016 will be some kind of compromise candidate beloved to their traditional bases running with them on the vice presidential ticket. And yet, both sides of this Bush-Clinton retread reflect the subterranean power struggles Disingenuous White Liberals are having with their Constituencies of Color. In her junior year at Wellesley,, Clinton became a supporter of Democrat anti-war candidate, Eugene McCarthy. Following the assassination of Martin Luther King Jr., she organized a two-day student strike and worked with black students to recruit more black students and faculty. After the 1968 Republican National Convention, she left the party for good over what she perceived as its veiled racism. In 1969, as a Yale law student, Clinton helped coordinate the efforts of the American Civil Liberties Union to monitor Black Panther, Bobby Seale’s trial for the murder of suspected police informant, Alex Rackley for civil rights violations. In the summer of 1971, Clinton interned at the law firm of Treuhart, Walker and Bernstein of Oakland, California. The firm was well-known for its support of constitutional rights, civil liberties, and radical causes (two of its four partners were current or former Communist Party members). Besides the name recognition and being married to the country’s first “Black” president, all of these leftist, pro-minority causes Clinton attached herself should have made her a shoo-in for the minority vote, particularly the African-American support she had courted until an African-American challenged her for the nomination which she lost after a hard fought, acrimonious campaign where she and Bill were all but called racist. I imagine that the 2016 presidential hopeful, Jeb Bush, took notes. 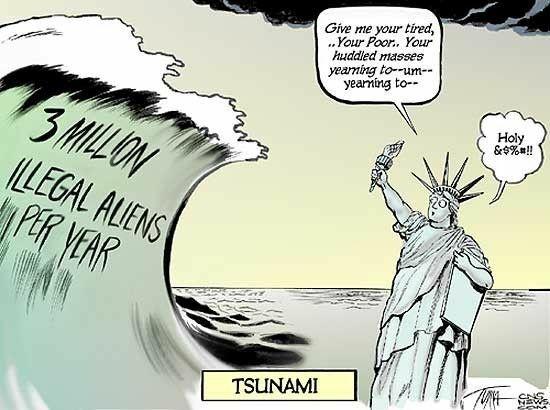 Ever since the Immigration “Reform and Control” Act sponsored by Rep. Romano L. Mazzoli (Democrat) and Senator Alan K. Simpson (Republican) was signed by President Ronald Wilson Reagan to amnesty approximately three million Hispanic “undocumented workers living in the shadows,” the governmedia estimate of Hispanic “undocumented immigrants” has remained frozen at twelve million. If that figure seems familiar, it the number of Spanish-speaking people who ended up actually being amnestied in the end. If you use the Rule of Four from the initial amnesty as an ultra-conservative estimate of the next round of Spanish-speaking “undocumented workers living in the shadows, then twelve or, more likely, fifteen million scheduled to be amnestied would end up multiplying to about fifty to sixty million Spanish-speaking new voters in the country for both parties to woo, which is why the Hispandering has been going on since a handful of Cubans snatched defeat out of the jaws of victory for Al Gore and made President George Dubya Bush possible. Marco Rubio,a Cuban-American, was positioned to be the Great Republican Hope for a Minority Candidate. He spoke fluent Spanish and had the requisite vowel at the end of his name to appeal to Hispanics AND he looked clean, wholesome, and Caucasian enough to appeal the Republican White voter’s base. Plus he was far more qualified to be president than Barack Obama. From 2000 to 2006 Rubio repeatedly re-won the 111th House District seat representing Miami in the Florida House of Representatives. He became the first Cuban-American to become Speaker of the Florida House of Representatives in 2003. On November 2, 2010, Rubio won the general election to become Senator of Florida. In the 2012 elections, Marco Rubio was placed on the short list for and actively being looked as Mitt Romney’s running mate, but he made it clear he was not interested and Paul Ryan was chosen instead. Bush and Rubio’s friendship went back nearly twenty years. Bush supported Rubio for various political offices since 1998. When the 2010 Florida Senate seat came open, Ruben vowed he would not contest Bush for it. Fortunately for him, Bush declined to vie for it. 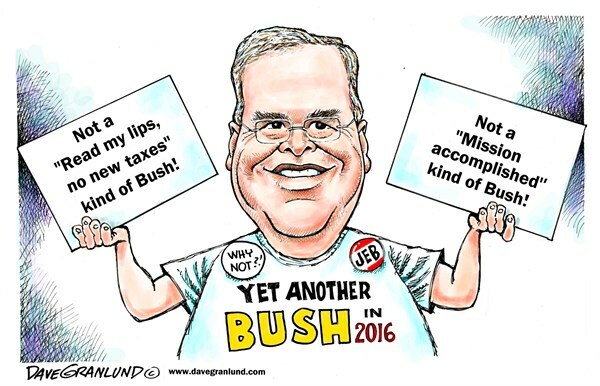 Unfortunately, Rubio took Jeb Bush’s “lack of interest” at running for president in at face value. Was The Man BEHIND The Curtain Jeb Bush?! Rubio got an “Atta boy” from Jeb Bush for was joining Senate Democrats Charles Schumer, Richard Durbin, Michael Bennett, and Bob Menendez in “The Spirit of Bipartisanship” (both stupid AND evil) along with Senate Republicans Juan McCain, Lindsey Grahamnesty, and Jeff Flake. 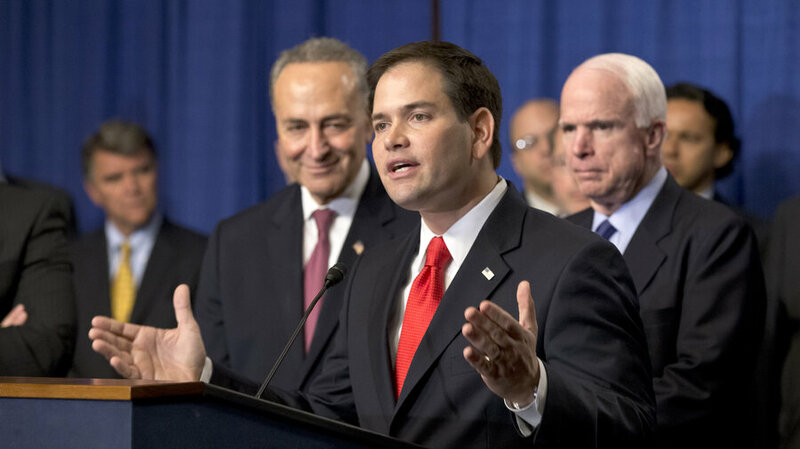 Christened as the “Gang of Eight,” all eight of them collaborated together on the Comprehensive Immigration “Reform” bill. But Rubio became the face of this bill as he defended his decision to his skeptical Tea Party supporters. So, why did Rubio suddenly try to back off and back off quickly from a bill HE co-authored no doubt with much encouragement from Jeb Bush? So it became Rubio’s Bill. Isn’t it strange how this widely unpopular bill isn’t known as Flake’s Bill or even the McCain-Graham bill in honor of Republican Bobbsey Twins, Lindsey and Juan? For some odd reason it got placed and remains hung around the Tea Party candidate, Rubio’s neck like a stinking, decomposing albatross to this very day. Though his fingerprints are all over this bill, the one person’s name who isn’t on this bill is Jeb Bush. Did Rubio’s “mentor” maneuver his “protégé” into putting himself into an untenable position? By co-sponsoring such a bill, Rubio had made himself anathema to his own Tea Party supporters of whom many comprise Border Security Supporters. By backing away, Rubio put himself on the outs with any Hispanic supporters he hoped to woo. Either way, Jeb Bush benefited. Rivera’s public support of Jeb Bush as “more Latino” than Marco Rubio suggests some sort of collaboration between the Anglo Bush and Mestizo Hispanics against Criollo Hispanics much the way the Jews collaborated first with the Anglo Protestant elite against White Catholic ethnic enclaves during the thirties through the fifties as laid out in E. Michael Jones’ Slaughter of the Cities: Urban Renewal As Ethnic Cleansing, and then collaborated with Irish Catholic ethnics like Senator Edward Kennedy and Rep. Phil Hart with the 1965 Immigration and Nationality Act (Hart-Celler Bill) against the Anglo Protestants. Since both Bush and Rubio hail from the same state, a compromise Bush-Rubio ticket is impossible. As a result, I predict that Marco Rubio’s campaign for presidency in 2016 or anytime in the future is already dead in the water if Bush wins. I had originally started this post inspired by hipsterracist’s post about a future caste system. At the time, I was going by all the Hispandering blather I was reading and watching and listening to by both sides of the aisle. I have long suspected that the Anglo elite love, love, love the concept of a Latinized political system where the rich get to live in villas with private security that are better armed than the local police while lording it over the peons crowded in the favelas. But I assumed that the Anglo elite were going to make their own separate peace with Latino leaders by forming marital alliances but pretty much cede any outward trappings of power by easing themselves into the back seat as silent partners. I thought that Jeb Bush was the perfect prototype for my theory. He had already married a Mestiza and had several Castizo children. I was pretty sure that he would back Rubio to the presidency as some sort of quid-pro-quo where Rubio would later support his son, Jorge Prescott Boosh. But all the sudden Rubio, The Great Republican Hispanic Hope who could do no wrong, because he was supported by the Tea Party and could bring them into the Greater GOP tent while appealing to other Hispanics started making serious missteps with such methodicalness and regularity that I could only assume that someone was manipulating him. I smelt a rat when Jeb Bush announced he was “considering” a run for the presidency right on the heels of Rubio’s announcement. Why wasn’t he pushing Rubio as enthusiastically for the Republican Presidential spot as he had Rubio for Romney’s vice-presidential spot? Then when I found those links where he was gung-ho for the Gang of Eight plan until it became Rubio’s Bill and then came out opposed to a path for citizenship as opposed to just residency and then met with Tea Party leaders himself, I knew he had snockered Rubio into being the fall guy. It’s really a shame, because all my research of their friendship made it self-evident that Bush could have made a private quid-pro-quo agreement with Rubio promising his support of Rubio for the Senate in 2010 in exchange for Rubio’s support for president and Rubio would have honored it. But when you are a snake you assume everyone else is. The Bushes have really mastered the art of cultivating the appearance of warm, friendly, decent people; good humored and genial almost to the point of goofiness. That causes people to make the mistake of either taking them at face value like poor Rubio did or totally underestimating them like Al Gore did. But when it comes to politics, the Bushes are every bit as ruthless, and cold-blooded as the Clintons are. They just finesse it a helluva lot better. The Bushes have successfully internalized the chameleonic adaptability of the Jews. A new flavor for every shift of the political and demographic wind. Just so you know, that wasn’t me, it was some commenter that linked to my (fictional) blog. But people really underestimate just how exploitative war is. Gerald (alias Geraldo) Rivera is a Jew. His positions should be understood as representative of Jewry’s interests rather than that of Mestizos, although he is technically a variety of mixed Latino, being a Puerto Rican-flavored Ashkenazi freak. It’s great Bush is running, it helps people to remember that USA isn’t exceptional and that we’re run by an organized crime family like most countries are. The Puzo quote could not be more appropriate. 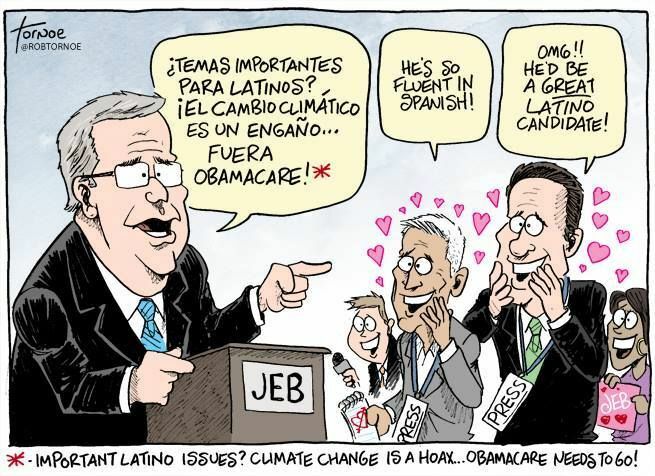 Sailer wrote recently that Jeb Bush’s life long goal was to merge USA/Canada with Latin America. He, of course, personally and genetically did this himself and now wants the rest of the nation to follow along. Imagine if Yeb presides over the emerging North American Union, he will outshine even Poppy in the history books. Here’s a look at what our hostile elites are preparing to subject us to in the not too distant future. I want off this ride! When the Republicans began pandering to Hispanics for their votes was when I left American politics. If I were to ever again believe in a political party that party’s platform would have to begin with the total rejection of egalitarianism as a first principal. I lost faith in the American political system to achieve any positive change after becoming convinced of the truth behind 9/11. I was reading today that people were afraid that Trump might run as a third party candidate because omg that would give the election to Hillary. But, quite frankly, I don’t care. All of the establishment Republican candidates, Bush, Rubio, Walker, Graham, you name him… all of them are Democrat light. And Zionist to boot. Every one of them would leap at the chance to wear a Yakima and pray at the “Wailing Wall” in Jerusalem. Not one of them would dare say that Detroit is failing because blacks run it. The Republican party is at best a controlled opposition party. Screw them. This entry was posted on July 6, 2015 by clytemnestra57.